Join the new "Mount Hua Competition” balanced arena game mode. Mt Hua is an optional 1v1 and 5v5 arena in which players are given the Power score and forced to duke it out. Defeat the opponents to level up and get better rewards. Found in the PvP menu. 1) The event is available from noon to midnight. In this event, all players have the same Power, but they can choose different Martial Arts. Players can use any Martial Arts they have learned. Free Martial Arts for limited time are also available for players. 2) All skills of the selected Martial Arts reach full cultivation level and level 7 Echelon. Players can allocate these skill points by themselves. If not, system will allocate them at random. 3) System will arrange players with the similar power as your teammates or opponents based on individual/team's average arena level (initial arena level is 1000). 4) In 5 vs. 5 mode, each team should have five players. System will search for random players if slot is left available. 5) No respawns - players have only one life in battlefield. Cooperate with your teammates and defeat all opponents to win the battle. 6) Arena Rankings are determined by arena level. Winning will increase Arena level while losing will decrease it, the value is determined by the opponents' level - defeat enemies with high Arena level to gain more of your own. Note: For teams ranked Gold or lower, arena level will not decrease even when they lose. Quitting midway through a battle will decrease arena level, regardless of rank. 7) Arena level and Arena Rankings will reset at 5:00 a.m. every Monday. 1) Arena Rankings are calculated every night at midnight. Top 3 players will get Limited Time Exclusive Title. First Place: Undefeated, Second Place: Boundless, Third Place: Veteran. 2) Arena quests are refreshed every day. Complete the quests to get Enhancement material, Pawn Tickets, Martial Arts Scroll Fragments, and Elemental Stones. New large scale Guild War game mode known as the Gleaming Peak Battle. Guild bring their warriors to a massive battlefield to fight. Register in the Daily - PVP interface. Guilds bid to join the battle, and members can join at the set times. 1)	Bidding Period is from Monday to Saturday. All guilds can bid during this period. 2) Only Guild Leader and Vice Leader can initiate bidding. 3) Guilds make bids using their Guild Funds, gained through Donations from members and completing guild quest. Guild Funds will be converted into Bidding Funds for Guild War. 4) Guilds have the choice to cancel their bid during bidding period, in which case the Bidding Funds will be refunded. The guild can still reinitiate bidding after quitting. 5) When the bidding ends at midnight on Saturday, the top three guild with highest Bidding Funds will attend the Guild War to scramble the Brightness Peak. All of their Bidding Funds will be deducted. 1) Players above Level 35 can join the war. 2) Battles will take place 8:00-8:47 PM on Sundays. 3) All members of the top 3 guilds with the highest Bidding Funds and the current occupier can join the war. 4) Players in a team cannot join the war. In the Guild War, players cannot form a team. 5) Peace/Jianghu Mode can't be changed in battlefield, be sure to check the Protected Targets settings before you join the war. 2) Players can attack any players from different Guilds. 3) There are three strongholds: Kung Fu Practice Platform, Treasure Pavilion and Military Camp. Each stronghold has a Battle Flag. Players aim to destroy the enemy Battle Flag. 4) Battle Flags will take 1 damage for each hit. When a Battle Flag is destroyed, the Guild which deals the highest damage to it occupies the stronghold and places a new flag. 5) Battle Flags in different strongholds have different HP points. 6) During the occupation, the occupier gets 10 Guild Points every 10 seconds. 1) Guild Rankings: Occupying strongholds will increase Guild Points. Guild Ranking is one of the important aspects to win. 2) Personal Ranking: The more people you kill and the more times you attack Battle Flags, the higher your Personal Ranking will be. 1) Starting from when the first stronghold is captured, if a single Guild occupies all strongholds for five minutes, that Guild wins. 2) If no Guild wins before the timer ends, the Guild which occupies all strongholds when the battle ends wins. 3) If no Guild wins earlier and no guild occupies all the strongholds when the battle ends, the Guild with the highest Point Ranking wins. 4) When the battle ends, all players in the instance cannot move till they are transported out automatically by the system. 1) When the war starts, the strongholds begin in the possession of the Guild occupying the peak. Every guild has their own Revival Point. The occupying Guild has two Revival Points. 2) When a guild occupies all the strongholds, it becomes the temporary occupier and exchanges the Revival Point with the former occupier. 1) Victory and defeat rewards will be sent to the respective participating Guild members by in-game mail. 2) Personal Rewards: Top five ranked players will receive rewards after the war. Top 3 players will get Limited Time Title via in-game mail. 3) Rewards for Occupier: When occupying Gleaming Peak, all the members of the occupying Guild will get "The Biggest Guild" title as well as a daily bonus. Guild Leader will also receive Gold, and the "Lord of the Brightness" title. The leader of the guild which occupies the Brightness Peak for 3 weeks consecutively will get an exclusive cloak (Can upgrade, cannot enhance). Feral Staff: Quarterstaff Skill.When a guild wins the Guild Battle, the Guild Leader will get an Ancient Manual Shards Pack, which offers a chance to get Feral Staff. 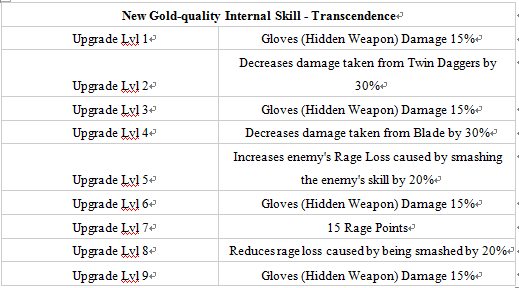 Transcendence: Jianghu internal skill, acquired by Tyrant instance. Reforge Equipment: Choose this function in the Reinforce interface to "Reforge" gold and jade equipment (except cloak) above Level 20. 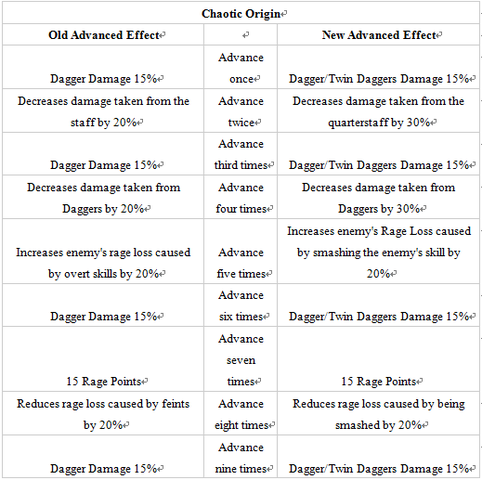 Reforged equipment restores to the initial state at level 20 and gets all upgrade materials and enhancement materials back. Change Name: Click Change Name button in Function interface to change name. Changing name the first time will cost 400 Gold. The more times you change name, the more Gold it will cost. New outfits: Demon Wing Yarn, Leisure Jade Clothing, and Golden Snake Raiment; New Weapons: Fire Dragon Staff, and Red Head Spear Cover.View and purchase them in Costume interface. 1. Skills used in a battle are judged after hit now. According to crash-box protocols, the smashed target's skill will be interrupted, and deal no damage and cause no effect. 2. 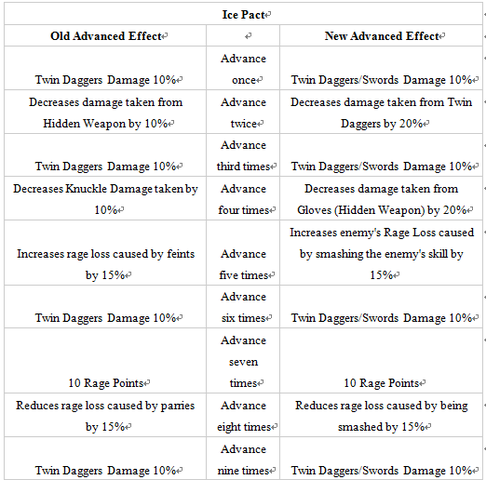 After adjustment, Rage can only be deducted when the skill deals damage to the target. Example: Before: When you used Mount Hua Sword Emerging Cloud and evaded from the opponent's Bare the Fangs, both sides' Rage would be deducted. Now: Only the damage taker's Rage will be deducted. 3. 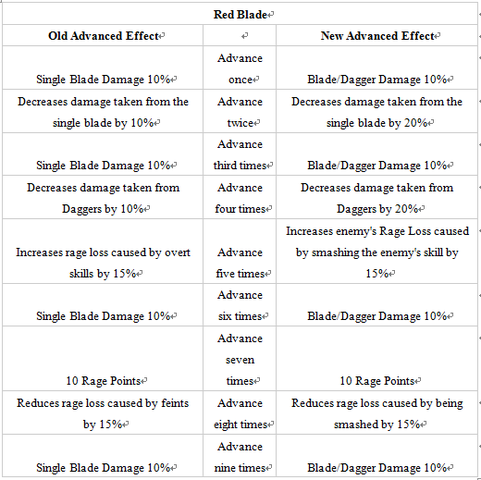 Changes rage loss caused by overt skills from 5 points to 10 points. 4. When you use Parry during a flying skill period, the flying skill ends immediately. 2. Adds Minimum Power Limit to Hard Level. Players should meet the requirement to start the challenge. 3. Players can invite Silver Warriors and Heroes to join the battle in some Levels in Chapter 1. 4. When Achievement is acquired, prompt will appear and manual submission is required. 1) The character wears nightstalker's clothing. 2) Information amount will show above the head. 3) The character is exposed all the time. 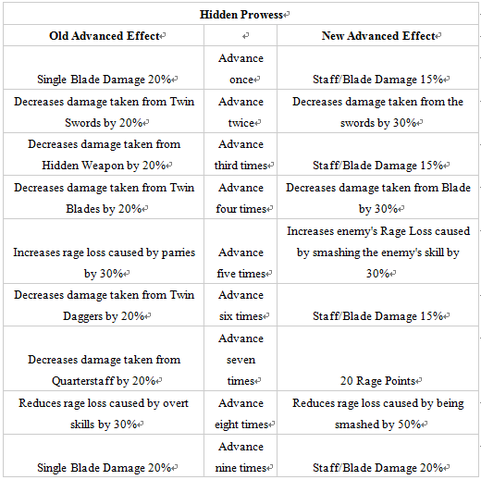 4) Max Flying Skill Points are reduced to 20. 1) After completing a Patrol Mission, quest reward offers a chance to get Jianghu Martial Arts Scroll Fragments. 2) Players can attack Spies. 3) Cancels the original Patrol Skill and adds a new skill Ask Patiently, which can be used on offline schoolmates to have a chance to win a piece of Information, with 20-second cooldown period. 1) Adds School Raid Killing Rankings and offers rewards. 2) Changes NPC's name from Script-carrying Disciple into Script Stealer. Both raiders and defenders can kill Script Stealer to get the script. 3) When players are carrying script, their Max Flying Skill Points will be reduced to 20 points. 2) Cancels the cooldown period of Kidnapping and Rescuing and adds offline players' spawn point and spawn frequency. 3) When players are carrying the Sack with a captive inside, their Max Flying Skill Points will be reduced to 20 points. 1) Level 35 is required now to join the event. 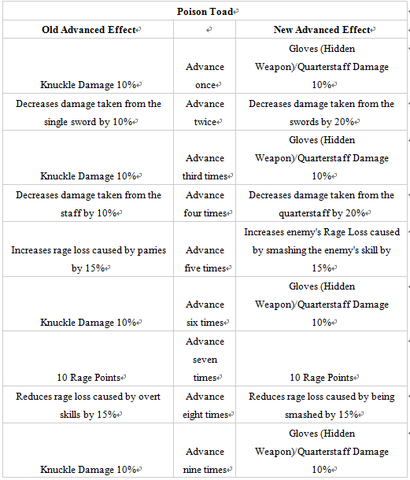 2) Some adjustment in rewards. 1) Max HP increases by 10% every time Tyrant appears. 2) If Tyrant is not killed before respawning, its Max HP decreases by 10%. 3) When Tyrant is killed, Damage Ranking and rewards will be displayed. 1) Max HP increases by 20% every time World Challenger appears. 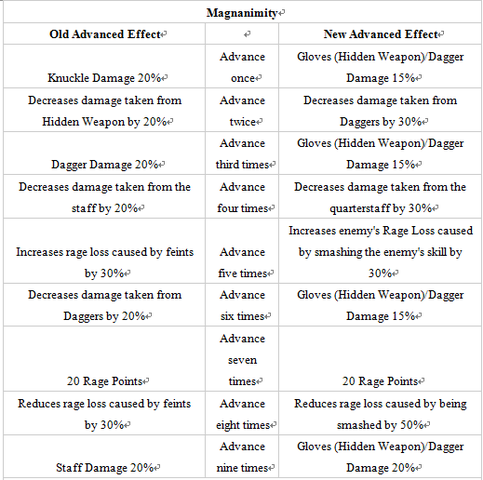 2) If World Challenger is not killed before respawning, its Max HP decreases by 20%. 1) Sky Arena available time is 12:00-23:30 PM every day. 1) After killing Jianghu Legend above level 30, players have a chance to get Elemental Stone. 1) Click on Quest Track can transport to a random scene. 2) When players have no more chances, they will not receive invitations any more. 1) Minimum Power must be acquired to enter Twilight Village and Green Cloud Castle. 2) Silver Martial Arts Scroll Fragments acquired in Twilight Village (Easy/Hard) and Green Cloud Castle (Easy) are bound now. 1. 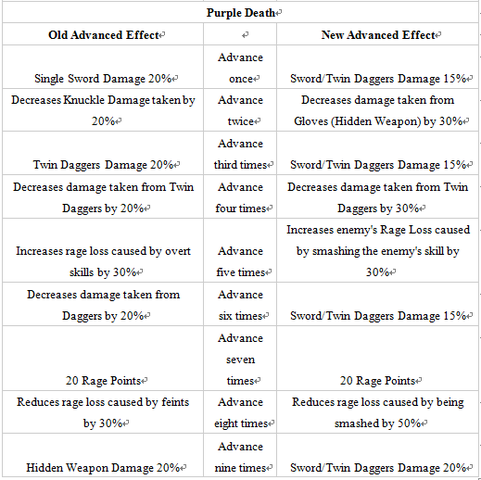 Removed the "Whole set Advancement" function. Skills must now be advanced respectively. 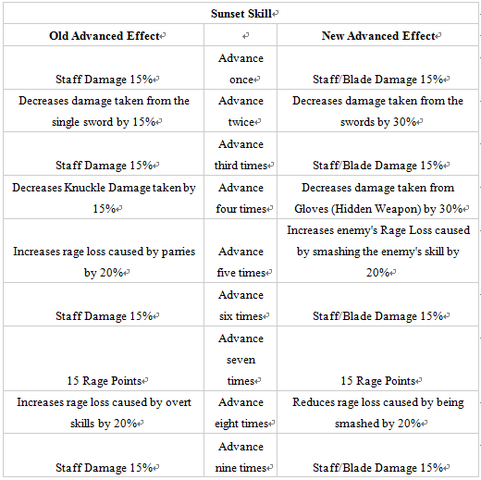 Each skill advancement increases the damage it deals. When all skills advance once, you can get 1 Skill Point. 2. Top players in Rankings receive new marker in Suzhou and School cities. Other players can give them praise to get Treasure Chests. 4. 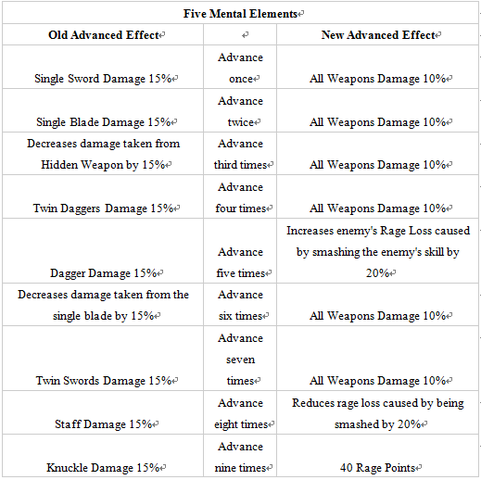 Optimizes the interfaces of Martial Arts, Upgrade, Reinforce, Treasure, Chat and Instance.